Whew. Today was full. First, I fried scrambled eggs with feta and coffee. Then, I called Arvanitis to schedule my first lesson today. At 10:30, I set out for Klafthmonos Square to buy a phone. By the time my phone was purchased and set up (I got distracted at Apostoliki Diakonia, an eccliastical bookstore), it was already 11:15, near the time Arvanitis told me to meet him in front of the National Library at Panepistimio, or University. Panepestimio is over-the-top neo-classical hellenic architecture (guess who designed it? Germans and English of course). After a wave hello, we walked down Askilipiou, first passing a taverna which he recommended as having the best souvlaki (mental note), then past the imposing St. Nicholas church to his apartment on Nikoforou Ouranou. He explained that he used to have an apartment on Βασιλείου Βουλγαροκτόνου who was an 10th century Roman emperor, and Nikiforos Ouranos was his general. He went from the emperor to the general. The lesson began with a lengthy discourse on the history of byzantine chant and its notation. The notation began as an aid to memory with one or few syllables representing an entire melodic line. This notation took years to master. About 200 years ago, several cantors reformed the notation to be more analytic, or one character per note, so that a cantor could learn and sing music much more efficiently. 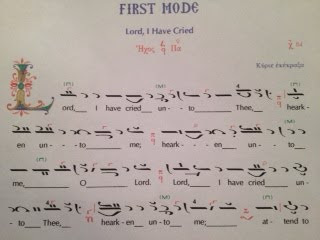 Next, we moved on to lessons in Margaziotis (an elementary chant textbook with exercises). He explained the history of certain characters, their meaning, application, expression, execution. My primary purpose of these lessons is to learn the oral tradition of singing the chant. One cannot simply pick up a piece of sheet music and properly sing a hymn. 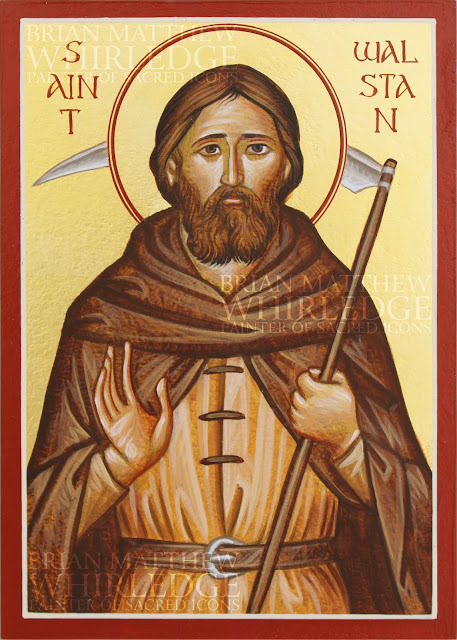 There are many qualitative signs in the byzantine chant that must be learned from another living person steeped in the unbroken 1,700-year oral tradition. For this reason the staff notation (called pentagram in Greek) is simply inadequate. Likewise, these qualitative signs can not be learned from a book (written explanations exist, but are primarily an aid to memory and must be accompanied by instruction from the teacher). I am concerned with the ornaments, because these especially are strictly oral. Arvanitis explained that while the ornaments are important and are always written in the text, it is also important to not always use the ornament, and that part of the art is knowing (or deciding) when it is or is not appropriate or beautiful to use the ornament. Byzantine chant is a beautiful musical art because it is so variable and has so much room for expression in the performance. 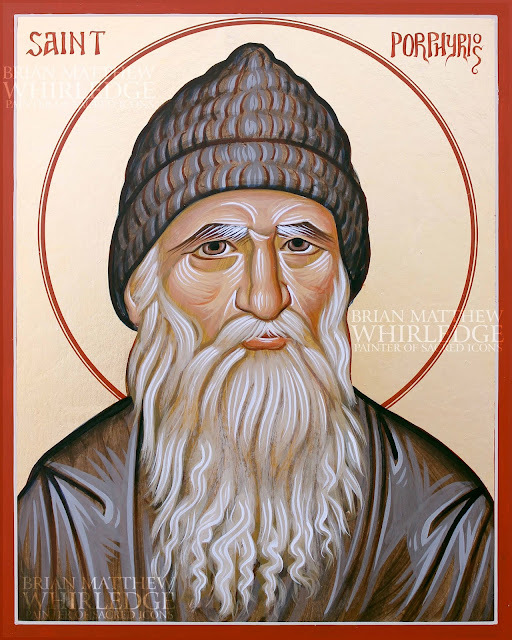 Two cantors steeped in tradition may read the same music, and keep the same relative melody, but may chant it quite differently, and both be right. It is an art, not a mechanical reproduction. Because this musical art is strictly text-based, the notation has specific rules about which symbols to use for different cases, depending on how the text and melody move together. For example, there are many different characters that tell the cantor to move up one step (C to D, for a western equivalent). Different characters to move up one step are used if it begins a syllable, continues a syllable, is an accented syllable, is a local melodic peak, is followed by one descending note, or two descending notes, etc. The whole system is based on marrying the text and music, and helping the cantor anticipate what is coming next. After the lesson, we parted ways. I stopped by the nearby St. Nicholas and was stunned by what was inside. 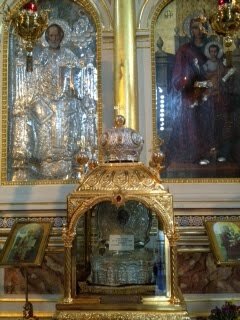 After taking the above photograph (with permission) and venerating the icons, I noticed a golden reliquary in front of the icon of St. Nicholas and approached the iconostas (the wall of icons in the front of the church). This church has relics of St. Nicholas. I am awestruck. 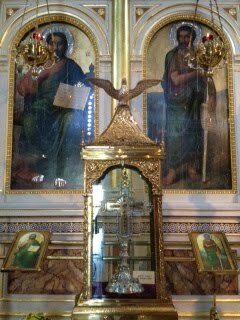 I happened to notice another reliquary in front of Christ. A piece of the precious and live-giving Cross of our Lord. In awe and full of faith, I began my walk back to my apartment. I approached the taverna recommended by Arvanitis, when I heard a friendly hello and looked over to find my teacher also had the same idea. 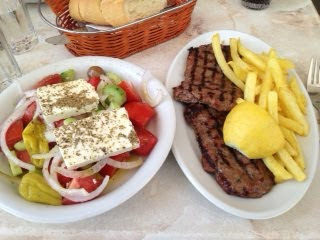 I ordered "το ίδιο" or the same, since what he ordered sounded good (besides, he knows the place). It was a Greek hamburger (seasoned quite unlike the American staple) and served with french fries (quite like the American staple). I also ordered a salad, which was incredible: two slabs of feta on a bed of tomatoes (that actually tasted like tomatoes), cucumbers, onions, olives, and peppercini, slathered in oil and vinegar, and not a single shred of lettuce to be found. During lunch, we talked about everything from music to cultural differences to politics. I mentioned that in Greek, he mentioned the pentagram for the staff. I explained that in English, pentagram is a Satanic symbol. "More reason," he said, half joking, "that only Byzantine notation is God's music." After lunch, we made some copies of musical exercises, and parted ways. 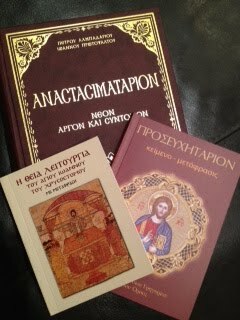 I stopped by Apostoliki Diakonia to buy an Anastimatarion (Sunday Resurrectional music book), a prayer book, and a liturgy book. The prayer book and liturgy book are both formatted with Koine and modern Greek on facing pages. On my way to my apartment, I stopped by the Fish Spa. Christine helped me put minutes on my phone. 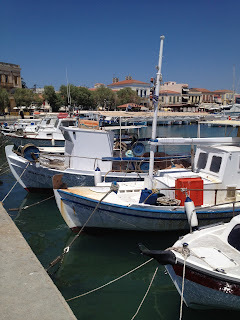 In Greece, no one buys plans like Americans, but rather, everyone buys minutes and "tops off" their phone. I returned home, rested for a minute, then set out to find "Morfi," a bookstore just a few blocks from my apartment. I couldn't find Morfi, but I did find another bookstore. That shop didn't have the tome I was searching for, but the shopkeeper was very happy to call another bookstore a few blocks away that did have it. Then he proceeded to write down the phone numbers and addresses of a dozen other bookstores in Athens that may have what I'm looking for. What business owner in America would voluntarily help his competition? I don't know where all the cold, rude Greeks are that everyone warned me about. A side note: he wrote the information on an old calendar page. Guess what day? My birthday. Weird, huh? I returned home, and gave a quick Skype call to Bekah, before setting out for Plaka to meet Stelios Georgantonis for coffee. 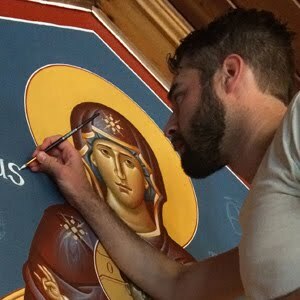 Stelios is an iconographer who lives in Athens. He was born and raised in Chicago. His father's tailor business was above the Art Institute and he sat in on lessons all through high school. After being accepted, he declined, and instead moved to Greece to study iconography. He is happy for me to study under him. Some iconographers like to hide their trade secrets. He explained that this is an art to glorify God first of all, and second, a determined student will learn anyway from someone else. He is doing a small installation later this week with which I may be able to help him. Unfortunately, in a week and a half, he will travel four hours south for a large installation, so I can't join him for that with my lessons (and wife) here. I am welcome to visit his studio any time to watch him work (I will learn a lot just from this). He will help me learn some guilding techniques, as well as wall-painting. His technique is different than what I have learned, but he said it is much more efficient (if it doesn't confuse me). I am thrilled that my studies in both the visual and musical arts have commenced. 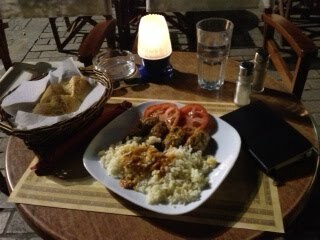 After coffee, I walked back at my apartment, stopping for Smyrna meatballs with rice at Minoas, beside the Cathedral. It's like a Christian fairy tale... so neat!